Understanding the links between theory and practice is particularly important for students in Clinical Embryology. They spend a considerable amount of time in host laboratories acquiring practical skills; now an innovative online learning resource - introduced by Celine Jones, Laboratory Manager at the Nuffield Department of Women's and Reproductive Health, and her team - helps them prepare for this key phase of their degree. Quizzes are at the heart of the online resource. They are based on nine videos of developing human embryos with which students practice their skills. This online tool extends classical teaching and provides hands-on experience of real embryological processes for students. They can then apply their new-found knowledge in the lab. Importantly, the response tool 'Socrative' allows students to ask questions and give direct feedback. Tutors can respond immediately and support the learning process. This holistic approach significantly improved interactions between tutors and students and led to a deeper understanding. Students' comments were very positive and they enjoyed learning online. The simple and user-friendly structure of this online resource can easily be transferred to other academic disciplines, way beyond Medical Studies. 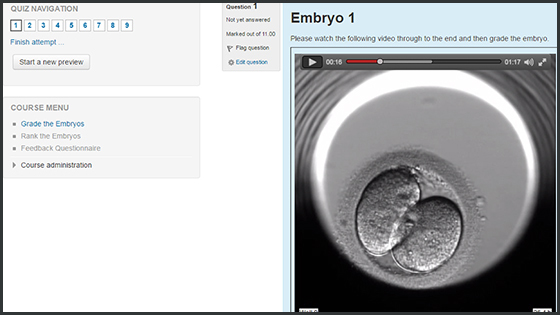 The online embryo grading exercise was technically difficult, but highly useful. Excellent practice! Students are asked to grade developing human embryos which prepares them for their time in host laboratories.